Withings Thermo launched as the first FDA-cleared & Wi-Fi connected temporal thermometer. Withings, part of the Nokia family, today announced the launch of Thermo, the first Wi-Fi-connected temporal thermometer. Originally announced at CES and honored with 2 CES 2016 Innovations Awards, Thermo goes to market in the US with FDA clearance and will provide one of the fastest, most accurate and most hygienic temperature measurements available. Thermo's designated app also integrates with Boston Children's Hospital's Thermia tool, offering users helpful insights on how they can manage a child's fever. Thermo measures temperature from the forehead's temporal artery, providing one of the most accessible and reliable assessments of body temperature, while ensuring a comfortable and sanitary process. With the new HotSpot Sensor Technology, a sophisticated array of 16 infrared (IR) sensors take 4000 measurements in just two seconds to detect the hottest point. A specially-designed algorithm then automatically corrects for biases, such as skin heat loss and the ambient temperature, allowing Thermo to deliver a single, highly-accurate temperature reading. Users simply press a button and scan the thermometer across their forehead, up to 1cm above the skin to get an instant reading. Since there is no contact necessary, Thermo is exceptionally hygienic. Two vibrations notify users when the measurement is complete, and the temperature is displayed in either Celsius or Fahrenheit. In addition, the device takes the users' age into account and provides instant color-coded feedback via an LED display that will glow Green for normal, Orange for elevated, and Red for high temperature levels. 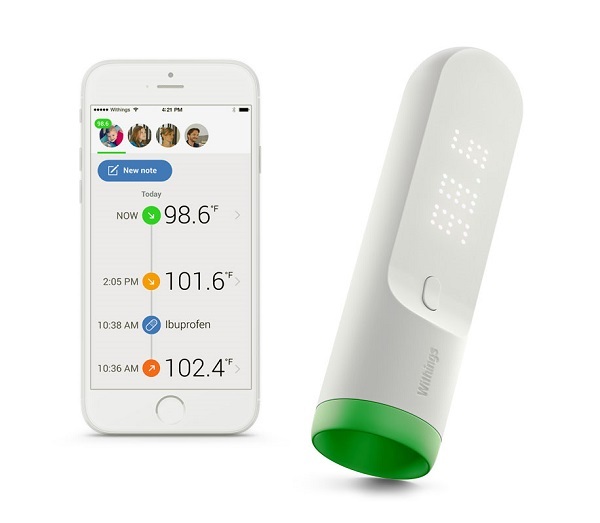 With Thermo, taking the temperature of a sleeping child, and evaluating their fever has never been easier. The device operates on two AAA size batteries that can last up to two years, making it exceptionally portable - easily transported from the household medicine cabinet to a mother's purse or father's pocket. Thermo automatically sends temperature readings to your iOS or Android smartphone on the dedicated application, via Wi-Fi or Bluetooth, allowing a seamless synchronization. The app gives the ability to better control and manage fever episodes for multiple users, by following the temperature trend and getting a clear fever status at any time. It also allows users to provide contextual information associated with readings, such as logging symptoms or making notes of any administered medicines. Notifications can be set to prompt parents with measurement reminders to better monitor fever episodes. The app also integrates with Boston Children's Hospital's Thermia tool, which provides educational information that can provide insights on how to care for a child with a fever. The Withings Thermo is a Class IIa Medical device and has been granted FDA-Cleared status in the US. Thermo joins the Wireless Blood Pressure Monitor in the range of Withings' FDA-cleared devices, and reinforces Withings positioning as a leader in digital health industry. Withings Thermo is now available for purchase in the US exclusively at Apple Stores, on apple.com and on www.withings.com for $99.95. It will be soon available in the rest of the world.